Officials at the UK's National Gallery in London and the Palace of Versailles outside Paris announced a ban on selfie sticks on Wednesday, saying they need to protect artwork and other visitors. A spokeswoman for the National Gallery said staff had been told to help enforce the ban. 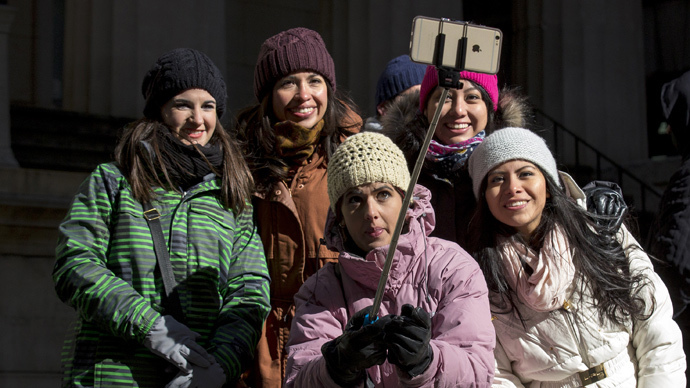 Selfie sticks are elongated poles on which a smartphone can be mounted to improve snapshots. Their popularity has resulted in soaring sales, but they are increasingly called obnoxious and dangerous. They have been banned at a growing number of global tourist attractions. Bans are underway at New York’s Museum of Modern Art, the Guggenheim, and the Trick, and are in effect at the Smithsonian museums in Washington, DC. Rome’s Colosseum, which has 16,000 daily visitors, banned selfie sticks last month as a security measure. “The twirling around of hundreds of sticks can become unwittingly dangerous,” Colosseum spokesman Christiano Brughitta told the Associated Press. Two American tourists were arrested last week after carving their names into the 2,000-year-old monument’s walls and then taking a photo with a selfie stick. Along with obnoxious and annoying instances, there have been deaths. Last November, a woman died in Spain when she slipped and fell off a bridge while trying to take a selfie. In August, a couple fell from a rocky edge in Portugal while trying to take a picture of themselves. The bans are even extending to music venues like Wembley Arena in London, as well as soccer stadiums. Soccer enthusiasts were starting to use selfie sticks as weapons against rival fans. Brazil has also banned them during the Carnival parades in Rio de Janeiro.